Much of the land of the mostly flat province of Groningen is used for agriculture, but the services sector accounts for about two-thirds of all of Groningen’s businesses, and the province’s high-tech industries are thriving (it is one of the country’s fastest growing information and communication technology centres). Groningen’s other main industries are chemicals, pharmaceutics and biomedicine, printing and publishing, shipbuilding and energy. The Groningen gas field was discovered 50 years ago and is one of the largest gas fields in the world, with reserves of 2,700 billion cubic metres of gas. 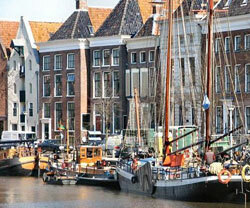 Yet Groningen still preserves its natural and historical heritage. Old castles, estate houses and medieval churches nestle among old trees and beside rivers and streams. And Groningen’s marshy, largely unspoilt Wadden Sea coast is a top breeding ground for common and grey seals and hundreds of thousands of shore birds. In the provincial capital, also called Groningen, life revolves around the Grote Markt, which is always the site of major provincial, national and city celebrations—a beautiful, leafy square with a shopping centre, the Town Hall, restaurants and cafés, and of course several markets. The province is also noted for the Arboretum Eenrum, the Hortus Haren and the Domies Toen, vibrant botanical gardens with thousands of trees and plants, butterflies and other insects. Groningen also has two notable museums: the Noordelijk Scheepvaart, which details the province’s shipbuilding and maritime history, and the Groninger, which houses a collection of Chinese and Japanese art and modern and contemporary works by prominent Dutch artists.